Stonewall Gazette: Struggling musician promotes himself by using Google Street View! 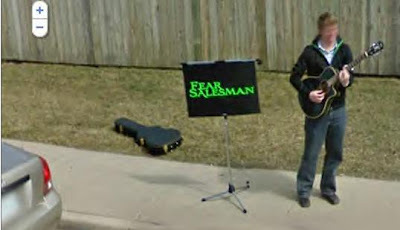 Struggling musician promotes himself by using Google Street View! Now this is clever! Canadian musician, Nate Heagy (pictured), needed to promote his music and when he learned that Google Street View was coming to his city, a light bulb went off! He followed the Google car and set up his placard and began playing. He learned the driving pattern of the Google Street View vehicle, followed it and did the set up all over and over again. Literally keeping one step ahead! The only thing wrong with his approach is that he didn't put a website address on the placard!